Passed down through generations of Rowlands. Pour eggs, buttermilk, baking soda, and vanilla into a hole in the center of the dough. Stir. Flour your hands and a rolling pin with more Wondra flour. Roll dough until it’s about 1/4 inch thick. 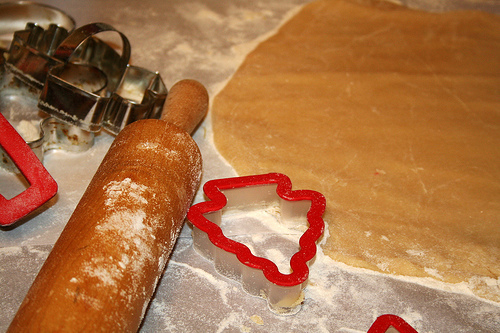 Use cookie cutters of your choice and place dough onto baking sheet (preferably a baking stone). Sprinkle some with sugar, and leave others for icing. Bake at 400 degrees for about 8 minutes. Prepare and color royal icing and use a piping bag to decorate cookies.